The Mary S. Byrd Gallery of Art is pleased to announce the 2019 Juried Student Art Exhibition, on view at the Gallery March 14 through May 10, 2019. The two-month exhibition opens with a reception on March 14, 2019, 5 – 7 p.m. Julio Gonzalez, a Charlotte, NC-based contemporary artist, served as this year’s juror. The annual Juried Student Art Exhibition allows students the opportunity to experience the jurying process and gain firsthand exposure to the workings of the art world. 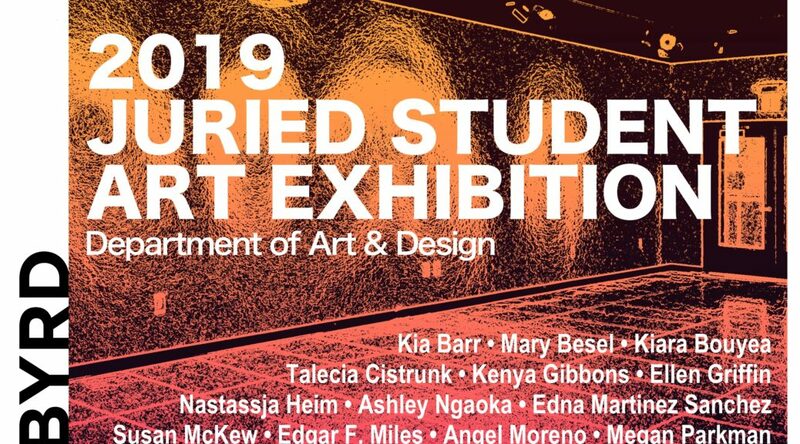 The 2019 exhibition showcases the works of student artists Kia Barr, Mary Besel, Kiara Bouyea, Talecia Cistrunk, Kenya Gibbons, Ellen Griffin, Nastassja Heim, Ashley Ngaoka, Edna Martinez Sanchez, Susan McKew, Edgar F. Miles, Angel Moreno, and Megan Parkman. Multimedia artist Julio Gonzalez is a self-taught artist and a native of Atlanta, Georgia. Since leaving Atlanta as a young teenager, Julio has traveled extensively and exhibited his work in murals, galleries, and museums across the Southeast. One of Julio’s defining characteristics as an artist is his use of Mexican and Mayan design elements to explore questions of contemporary human experiences and value. Julio cites the simple question “what if?” as a cornerstone of his creativity and practice, a way to approach his ideas from different sides and explore them to the fullest. He hopes viewers of his work will find themselves asking the same question and rediscovering their sense of interconnectedness, curiosity, and childlike wonder. The simple phrase “what if?” is the concept behind the name Wonder What If, a project of which Julio is the Creative Director. Between August 28, 2017 and August 10, 2018, Julio was hosted as an Artist-in-Residence by McColl Center for Art + Innovation in Charlotte, North Carolina. There he continued developing his multi-year multimedia project Dia de Los Casi Muertos, or Day of the Almost Dead, which delves into the differences of taboo and experience with death and aging between Mexican and American cultures. Julio’s time at McColl Center allowed him to explore new varieties of media, such as textiles, paper-making, and 3D printing technology. Recently, Julio presented his work in joint 2018 exhibition Wrestling the Angel in the Bechtler Museum of Modern Art in Charlotte, North Carolina. In 2017, he participated as a panel member in the Arts & Science Council Young Donors Society and received the Art Si Emerging Artist Award. He was honored with the 2016 Arts & Science Council Regional Artist Grant. That same year, he exhibited solo work SONRIA in Haylo Healing Arts Lounge and demonstrated live painting at The Mint Museum in Charlotte. Between 2010 and 2015, Julio painted six murals in North Carolina and California. In addition, he has participated in many local Charlotte community projects. Each year, Westobou seeks to support the work of local artists through an annual solo exhibition. This year, Westobou selects Jacki Mayo as our featured local artist. Her exhibition, Remember You Are Dreaming, will be on display at Westobou Gallery from February 1-March 15, 2019. The human condition is forever bound to the impressions that are received through the senses. Jacki’s latest work explores a multi-dimensional dream world of tricks and illusions we perceive from those senses which often fail us. She aims to make viewers question what is real by exploring beyond our own perceptions of reality and to be awakened to the infinite possibilities of life. 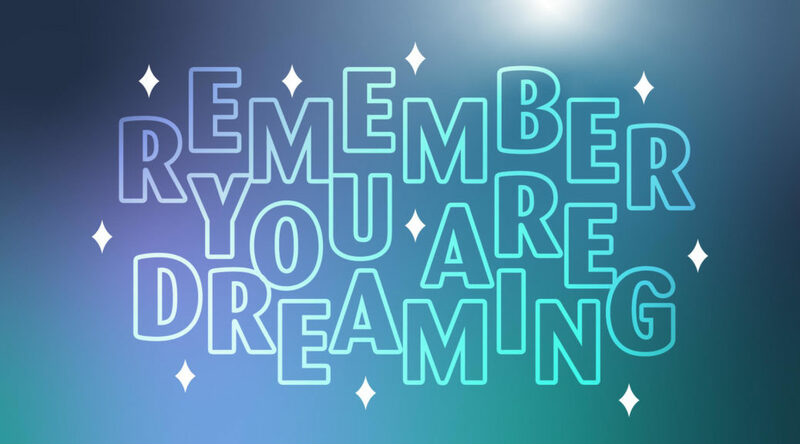 Remember You Are Dreaming is on display at Westobou Gallery from February 1 through March 15, 2019. Artist Statement: I enjoy exploring themes of space and sea, two vastly unexplored regions of mankind. Painting these scenes has become a tool for me to navigate and process my thoughts as I delve into the depths of my own consciousness. It has provided catharsis in the sometimes painful process of illuminating the dark corners of myself while also helping me to live in the present moment. It is my goal to inspire others, to encourage them to question their realities, to integrate the wholeness of their beings, and to awaken the creative child within, while also bringing attention to the natural and supernatural world. Artist Bio: Born and raised in Augusta, Georgia, Jacki first became interested in art at a very young age after watching her mother doodle a woman’s portrait. Later influences of Lisa Frank, Bob Ross, Alex Grey, and Jay Jacobs would build on that foundation and help shape the work she creates today. It has since become her goal to plant seeds of creativity in hopes that others may find solace in the wonderful worlds of their own imaginations. Westobou is pleased to announce SEEDS, our fourth annual juried exhibition of small works priced at an affordable $300 or less. SEEDS opens to the public on Friday, November 9 with a free reception from 5-8 PM at Westobou Gallery. Our 2018 juror, Mike Calway-Fagen, is the Curator of Exhibitions at Stove Works in Chattanooga, Tennessee. Nakia Jade presents the first ever Blazin’ Da Mic! This night will be filled will hip hop that will be sure to set the mic on fire needing an fire extinguisher to cool down your mind. This is will be a special night you will not want to miss. Artists includes Tone Jones, Tonio 2 Kold, Labeija, Deja More, THC Beejay, The Kidd Justice headlinging and Envi Royal.